Top-Rated SellerEzstik consistently earns high ratings from buyers thanks to fast shipping and excellent service. This will be a single color sticker as shown in the item picture. This is a DIE-CUT vinyl decal meaning that the background has been trimmed off. If there is a background color in the picture, it is used only as a representation. The background color will be the surface color you place the sticker on (or clear if you put it on a window). 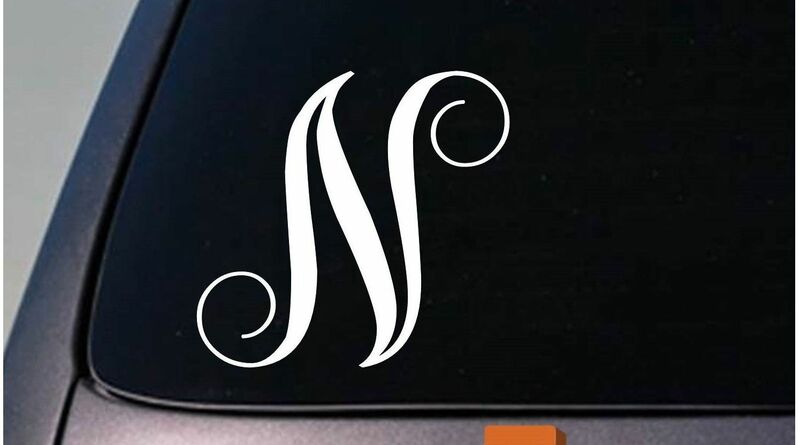 The decal will come with clear transfer tape, so you can easily apply it to anything you like (walls, windows, cars, mailbox, mirrors, laptops, etc etc etc). I use PREMIUM Oracal brand vinyl for all decals. Application is relatively easy. Your decal will come as THREE pieces - the backing paper, the sticker itself, and the clear transfer tape. Make sure you are applying to a CLEAN surface. You carefully pull the clear transfer tape up from the backing paper, making sure that it pulls the sticker up with it (if it does not, then firmly press down on it with a squee-gee or credit card or something similar until it sticks properly to the clear transfer tape). Then you apply the sticker and clear transfer tape to whatever surface you would like the decal on. You then use a squee-gee or credit card or something similar to firmly press down once again, making sure that the sticker STICKS, and then you carefully and slowly remove the clear transfer tape from the top, leaving behind only the sticker. I have found that on some surfaces (especially walls and wood surfaces), it helps to leave the clear transfer tape on for awhile to make sure everything is sticking well before removing it. I accept PayPal only at this time. I do not issue refunds or exchanges on vinyl decals. Please understand this before you bid. Some decals are more difficult to apply than others (especially the little ones!) - likewise, some surfaces are more difficult to apply decals to. We do bulk orders! Please contact us through with any questions you may have. Thanks, Powered by Turbo Lister The free listing tool. List your items fast and easy and manage your active items.